It's taken a lot of work, but, as they say... it's a wrap. 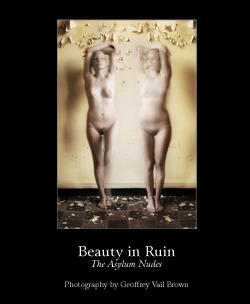 I'm happy to announce the topic of my upcoming solo show in December will be the asylum nudes series, which I have titled Beauty in Ruin. To go along with this, I'm also releasing a book of the images from this series. The book currently weighs in at 102 pages, containing black and white, color and hybrid / manipulated images. The book will be released on my website in November 2008. The show, which will appear at the InsideOut Gallery in Traverse City, will run from December 5, 2008 to January 7th, 2009. The opening reception will be December 5th from 7-10pm. Featured in the exhibit will be at least 20 large format giclee prints from the series. This was a great project to work on, involving a lot of dynamics that I found interesting - the contrasts of lighting, texture, in particular, the unique lighting attributes of the buildings, peeling paint, and just the sense of history of the location. Thankfully, the property is undergoing a restoration, which will transform it into a residential and commerical community. It was wonderful to be able to capture it in its transitional state, between what it once was, and what it eventually will become. I also had the opportunity to work with some of my best models on this project, and that really brought everything together. It was a great opportunity, and I'm grateful that I was able to gain access and permission for the few shoots that I did up there. Stay tuned to the blog or my mailing list for more information!